Spread the Quebec Strike! Solidarity with the Students! As the winds of mass protest and demands for change continue to surge across Quebec, now is the time for students and working people in English Canada to march in solidarity with the students’ movement. What began as opposition to tuition hikes in Quebec has grown into a fight against austerity and a defence of fundamental civil liberties. Thousands, almost every night, for over 100 days, and up to 300,000 students and workers on several occasions, have marched in Montreal and across the province. Because Quebec has a history of mass protest action, its people have the best public transportation system, the lowest tuitions, and the most affordable provincial child-care system in the Canadian state. The Liberal government under Jean Charest is worried about the potential power of a united front of students and labour to advance an agenda for the 99%. Charest’s use of the police to crack down on protesters, and the launch of a war against democratic rights, is his answer. Law 78 restricts freedom of assembly, protest, even picketing on or near university facilities—indeed anywhere in Quebec without prior police approval. The law also places restrictions upon education employees’ right to strike. This bill has been heavily criticized by the Canadian Association of University Teachers, and by dozens of legal bodies, as a “violation of fundamental freedoms of association, assembly and expression.” Despite every attempt by the Charest government, the police, and the right-wing media to defame the protests, students continue to hit the streets, incredibly ever growing in strength. In Ontario, with the rapid corporatization of universities, with tuition fees hiked by over 300% in the past decade, it is no longer enough to endorse the example of the Quebec students from afar. It is time to emulate their actions. While capitalist governments deliver bail-outs and tax breaks to the 1%, students are being forced to pay for a recession we did not cause! • Support the Canadian Federation of Students call for mass rallies, debates, and votes across Ontario in September in favour of a student strike to drop fees. Plan actions now to spread the Quebec strike. • Create a common front of students’ organizations and labour unions to support the Quebec students and fight the capitalist austerity measures everywhere. • ELIMINATE ALL TUITION FEES! Free post-secondary education is a fundamental right, not a privilege. • Cancel all student debt! • Repeal Quebec Law 78 and all laws that restrict the right to association, assembly, and expression! Protest is a fundamental right. 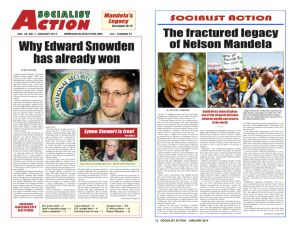 > Statement by Youth for Socialist Action – Jeunesse pour l’Action socialiste.